The significance of circulating tumor cells (CTCs) has been discussed for more than a century. 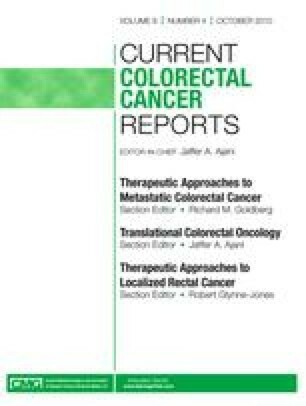 The advent of modern technology has allowed for more reliable detection of CTCs, and recent studies have provided compelling evidence that CTCs predict clinical response in metastatic colorectal cancer (mCRC). Combination of CTC analysis with independent prognostic factors has demonstrated powerful synergy in some studies. The ability of CTCs to predict metastasis and therapy-specific response has high potential clinical utility, with early studies showing promising results in colorectal cancer (CRC). Reliable CTC detection has also allowed for examination of tumor cell dissemination during surgery, and there appears to be a heavy dependence on the approach chosen. This review discusses the evidence for CTC significance, with particular focus on detection methods, novel markers, and clinical outcomes in CRC. Numerous opportunities exist for preclinical, clinical, and translational studies to explore molecular determinants within CTCs, as well as the value of CTCs in directing targeted therapeutics.